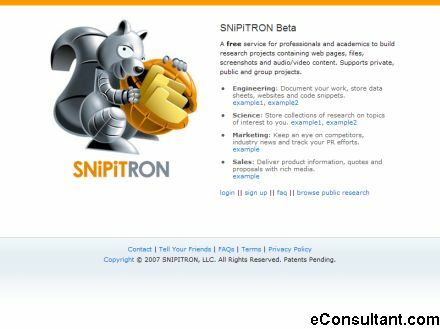 Description : SNiPiTRON is a tool for capturing, formatting and sharing content with other people. You can use SNiPiTRON as a way to store all of your online bookmarks. As you dig deeper, you’ll see that you can start to build research projects based on the web pages you capture. Then you can expand your research to collegues, friends, co-workers, etc. and start a discussion thread based on the content.